Flivasorb® Super Absorbent Dressings are comprised of a flexible, non-adherent wound contact layer, highly absorbent gelling fiber core and a breathable polypropylene outer layer. Flivasorb® and Flivasorb® Adhesive Super Absorbent Dressings are indicated for the management of moderate to highly exuding acute and chronic wounds. No adverse effects or reactions have been reported. 4"x4", 4"x8", 8"x8", 8"x12". Adhesive: 4(4/5)"x4(4/5)", 6"x6", 6"x10". Cleanse the wound according to clinical protocols. Pat dry wound edges. 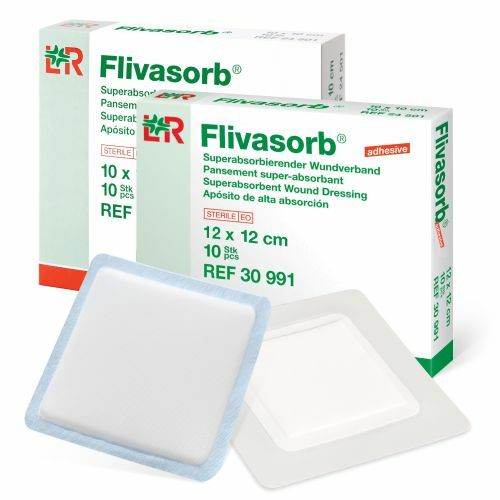 Apply Flivasorb® with the contact layer facing towards the wound. Dressing should extend beyond the wound edge by 2cm-3cm. Do not cut Flivasorb®. Secure Flivasorb® non-adhesive version with secondary dressing. Flivasorb® and Flivasorb® Adhesive may remain in place up to seven days or until maximum absorption capacity has been reached. Adhesive secondary dressing such as Suprasorb® F Transparent film dressing for the Flivasorb® non-adhesive version. Blue non-woven outer layer covering absorbent core with gelling fibers over thin and flexible conforming non-adherent wound contact layer. Flivasorb® Adhesive incorporates an adhesive border cover. L&R USA, Inc. (L&R) is part of a leading global medical device company, which has been delivering high quality healthcare products for over 160 years. L&R USA, Inc. is dedicated to providing health care professionals product solutions in the treatment of wounds, edema, venous disease and lymphedema to improve patient care and outcomes.